We can provide advice to limited companies, partnerships & sole traders on what to do when your business stops being profitable. If you have a debt problems - we can help in matters such at re-mortgaging, individual voluntary arrangements and bankruptcy. Helping advisers help their clients. The best way you can serve a troubled client is to help them survive. Our principal aim is helping you to achieve this. Creative solutions for companies, businesses and individuals. It is a fact of life that some businesses thrive and prosper while others stumble and fail, often falling victim to increased competition, changes in legislation, a loss of market or bad debts. At all stages of the economic cycle companies, businesses and individuals will invariably face difficulties and issues for which specialist advice should be sought. The key to success in times of trouble is to seek professional advice sooner rather than later as this can increase the options available. 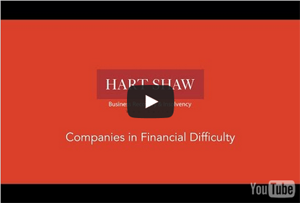 At Hart Shaw Business Recovery and Insolvency, we are used to helping people and companies deal with a wide variety of financial problems. Whether you are an individual who is overextended with consumer credit or are the director of a company facing closure, we can help you resolve your difficulties. Over the years we have helped hundreds of individuals and companies resolve their problems and in doing so have developed a wealth of experience, knowledge and skill. Hart Shaw Business Recovery and Insolvency will work closely with you to offer independent advice and develop a practical solution to your business problems - be it a formal insolvency procedure or informal restructuring. If your company or business is in difficulty, or if you have personal financial problems, we can help. Contact us now for a real, achievable and practical solution to your problems. Call our Confidential Helpline on 0800 068 68 57 or email advice@hartshaw.co.uk for a FREE initial consultation. Helping you through financial difficulties. The key to success for any business in trouble is to seek professional advice sooner rather than later. For more than 20 years we've been helping business to recover from their financial problems. There are many reasons why a company may have financial difficulties. There may be a sudden change in the market, a loss of a large customer or a bad debt.